September 15, 2004: Pyramid Pins! They're back! The Pyramid Pins are once again available in Warehouse 23, in many, many colors, each with a secret meaning. Or maybe more than one, but we can't tell you that fnord. 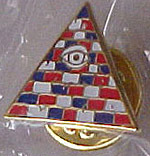 After two years of discussion, debate, argument, research, bribes, and divination, the Powers That Be have finally commenced implementation of Directive 412.5d, the reconfiguration of departments and subdepartments and the assignation of the appropriate "Eye-In-the-Pyramid" identification pin color(s) thereto. Consult the official chart to determine the appropriate Departmental Identification Pin to be worn by members of each department. If you change departments, change your pin. If you are uncertain as to which department you are in, report to Logistics & Support. If you lose your pin(s), report to Internal Security. The contents of this document are not to be revealed to anyone without a Level Fnord security clearance. All information contained within the Official Chart and Directive 412.5d is subject to change without notice or explanation. If you see someone wearing a pin not on the Official Chart, do not ask questions.